Welcome to another week of Wallpaper Wednesday where I feature a fabulous wallpaper that I’ve discovered out on the high street or online. These posts are rarely sponsored; I choose these wallpapers because I genuinely love them and if I had more walls I would use them myself! And so over to this week’s discovery. It’s called Loopy Lines designed by Wayne Hemingway at Graham and Brown. There’s so much I love about this wallpaper. The strong, warming hues of the blue background, the abstract pattern of the refreshing white lines and the very retro, yet contemporary style overall. It’s a winner for me. 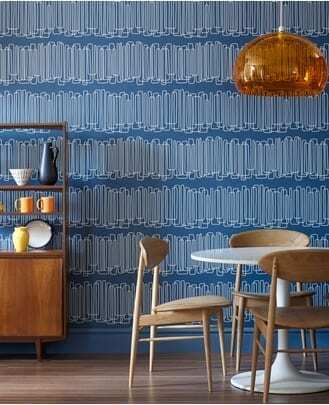 I love the Wayne Hemingway range at Graham and Brown; I’ve featured another Hemingway wallpaper on the blog in the past. What do you think of this one? Too retro for you? Or is it just right for your style? 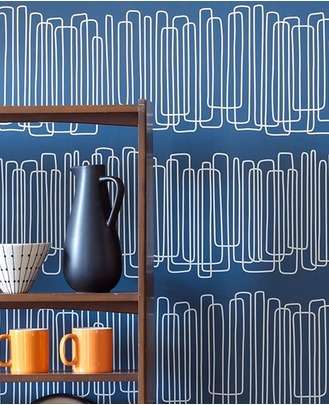 Loopy Lines is available at the Graham and Brown website or from wallpaperdirect for £30 per roll. Definitely not too retro for me, absolutely love it. The colour is perfect for my living room. I love Wayne Hemingway! Oh yes, it would look gorgeous in your home. I love the colour, so relaxing and warm. Loving your stool btw! I think this looks great. It kind of looks like a huge book case!